On Day Four of the U18 Five Nations Cup in Hradec Králové, Finland beat Russia 4-3 to stay perfect at 3-0. At the opposite end of the spectrum, the Russians have been a big disappointment, dropping to 0-3, but they played their best game so far. After being physically dominated by the USA and Sweden in their first two games, the Russians obviously felt that they had to come out more physical against Finland. However, their undisciplined play put them in a hole in the early going. Toni Kallela scored at the 2:11 mark to give Finland the early lead, and then he was immediately drilled into the end boards by Nikita Kucherov. 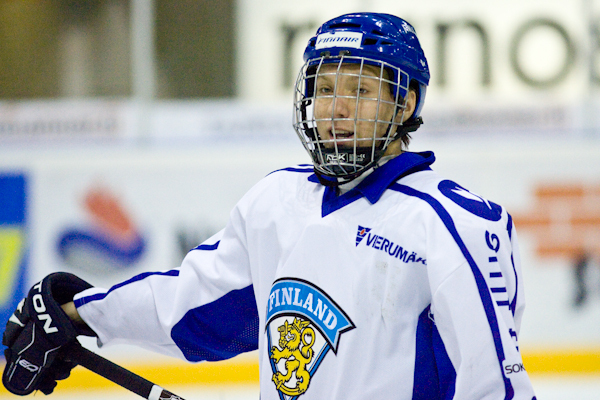 On the ensuing power-play Kallela set up linemate Markus Granlund to give Finland a 2-0 lead. After that, Russia seemed to settle down and play a more disciplined game. At 8:19, Sergei Smurov slid in a rebound to get them on the board. Then on the power play, Kucherov atoned for his earlier over-excitement by picking the near corner behind goaltender Niklas Kekki to tie the score. Russia took the lead at 12:41 of the second period, when defenceman Alexei Shamin one-timed Kucherov's pass past Kekki on another power play. The lead was short-lived, however. Finland tied the game on a power-play of their own when Granlund scored his second of the game on a wrist shot off the post that Joe Sakic would have been proud of. In the first minute of the third period, Granlund completed his hattrick on a set up from Kallela to give the lead back to Finland, and there was no further scoring. the game ends. Photo: Stanislav Souček, hockeynews.cz. As time expired, Russia's Konstantin Vorshev and Finland's Rasmus Ristolainen engaged in a fight. It's not clear how the players will be disciplined, but it wouldn't be surprising if both players will be suspended for their teams' last games tomorrow. That doesn't mean much to Russia, but for Finland, who will be playing for first place, the loss of one of their top six defencemen could hurt. With Finland and the United States both 3-0, their game on Sunday, which begins at 13:00 CET (UTC +1) will be for first place in the tournament. In Saturday's nightcap, the Czech Republic hosted Sweden. Traffic in front of goaltender Patrik Bartošák on Saturday night. In their last game of the tournament, the Swedes struck early, with Mika Zibanejad finishing off a beautifully-executed two-on-one with Ludwig Blomstrand at 3:01. Less than a minute later, they nearly connected again, but failed to finish. In the second period, the two teams began furiously trading scoring chances, with each team guilty of multiple miscues that gave their opponents odd-man rushes. Both goaltenders Oscar Dansk and Patrik Bartošák bailed their teams out more than once, before Sweden's Filip Forsberg sprung Gustaf Bjorklund on a breakaway, and he scored at 6:34 to make the score 2-0. "It was a good pass," Bjorklund said after the game. "I saw the D going to the bench on the change and then I waited at the bench for the pass and I went in." After that goal, the Czechs came back to play perhaps their best hockey of the game. They put on good pressure on a power play midway through the period, with their best chance coming when defenceman Petr Šidlík fired a slapshot that loudly rang off the goalpost, causing the crowd to groan in unison. A couple of minutes later, Michal Švihálek had a glorious chance from a Swedish giveaway, but was denied by Dansk. The Czechs continued to put on the pressure until Tomáš Pavelka blew a tire at the attacking blueline, giving William Karlsson a breakaway across two thirds of the ice. He buried his chance to make it 3-0 and quiet the energized crowd. Less than a minute later, Viktor Arvidsson scored on a deflection to seemingly put the game away. The Czechs managed to make a game of it in the third period, however. They got a pair of goals in the third period from Lukáš Kříž and Lukáš Sedlák, but Bjorklund scored his second of the game on a backhander to make it 5-2 with three minutes left, and that's how the game ended. "We were very tired today because yesterday was a very difficult match with USA," said Šidlík after the game. Referring to his goalpost in the second period, he added, "No luck today." Sweden lost its first two games but then won its last two to claim third place in the tournament. When asked about his team's performance, coach Rikard Grönborg said, "We're always aiming to get the gold. You know, there was a loss to the USA first game and also a close one in the second with Finland. But then, we got better as the tournament went on. We knew there will be the Czechs and also the Russians, both very tough teams to play. But we're always trying to win the tournament we're at." After Sunday's USA-Finland game for first place, the Czech Republic will play Russia, with the winner claiming fourth.